The essentials for you and your horse! There are endless choices in the world of horse care equipment, but you truly don’t need all of them! There is some gear that is essential to the care of your horse, and some that simply makes your life easier. I’ll tell you about some of the things that we use around the barn to make caring for our horses easier. Because hydration is so important to horses, the first thing I think of when it comes to horse care equipment is the horse water trough. Clean, plentiful water is crucial to have for your horse, and unless you have a natural source such as a creek or river running through your pasture, you’re going to need a horse water trough, or an automatic horse waterer. A typical horse can drink 10 gallons or more of water per day, so if you have several horses, you need to ensure that your troughs don’t run dry. In colder climates such as Canada, it is vital to have a livestock tank heater in your water trough for the winter months. It doesn't take long for water to freeze once the mercury drops, and horses still need access to ample clean fresh water all winter. Eating snow simply won't keep them hydrated! 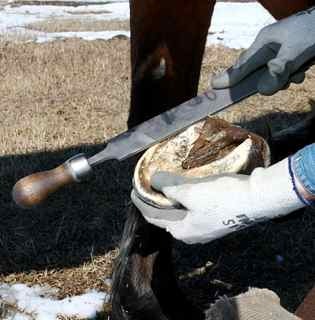 We do our own natural hoof trimming, so it is important for us to have our own equipment for this. If you use a farrier or natural hoof trimmer to take care of your horses hooves, you won’t need all of these hoof care supplies, but some of them might come in handy. Every horse owner needs at least a couple of hoof picks. One for your horse grooming kit, and one for your pocket or saddle bag when riding. You never know when your horse will pick up a rock in its hoof! It’s also a good idea to have a hoof rasp, like the one pictured above, of your own. Just in case your horse chips or splits a hoof. You can file down any rough spots on your own without having to wait for your hoof trimmer! You can’t avoid doing some chores when it comes to having horses! So there are some general horse care equipment items that are probably found in just about every barn, tack room or pick up truck! barn boots, or chore boots. Look for something waterproof with a good solid foot that can withstand being stepped on by a horse the odd time! If you live where there is snow, you'll want a high-leg and a thermal lining! Both Bogs and Muck Boots make great chore boots that will keep you're feet warm to -40 degrees! a pitch fork or hay fork, for feeding. This helps you avoid hay leaves getting down your sweater when you’re tossing hay over a fence...makes me itchy just thinking about it! a manure fork...essential for cleaning up the arena or round pen after a training or playing session. Not only does this keep your riding or play area clean, it keeps you popular with other boarders! If you have a large property or are running a boarding facility there is lots of additional horse care equipment you may need. From tractors to manure spreaders, fencing equipment to hay feeders, the list could go on indefinitely! As much as I dream of having an acreage and having our horses in our own back yard, there are many benefits to keeping them in a boarding facility. We don't have to worry about owning and maintaining very much horse care equipment, or the property and buildings! All of our horsey time is spent playing with, training, enjoying and caring for our horses!